What could be nicer than sitting with your little angel, flicking through the deceptive colorful pages of “EASY” cake decorating books? Naturally I now know the importance of cunningly obscuring the scary “only-a-fool-would try-this” pictures in the hope that food colorants and cake tins will be the only nightmares. If only hindsight had kicked-in on this occasion. But no. As we both stared at the double-paged Girl Power feature her beautiful cherub face lit up in glee while mine wilted in sheer panic. And I quickly realized we were both pleading “pleeease” but not for the same reason. BUT… strange as it seems there IS such a thing as ‘simple-steps’, not to mention that the ‘useless’ kitchen drawer is a haven for decorating tools and stencils. And the best part? After hours/days of blood sweat and tears you finally realize you CAN do anything you put your mind to! And the best lesson? – thank heaven for cocktail sticks! In the end, when the cake finally appeared for all to see, it was so lovely to hear the other little angels ‘ooh’ and ‘ahhing at my attempt along with their mums. But the best reaction without doubt was as the big kiss and thank you from the best little Power-Puff girl of all. Would I do it all again? Of course. In fact, I did! And trust me; if I can do it – anyone can! 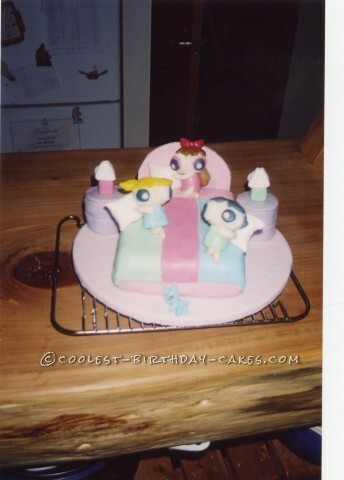 Birthday cake idea posted by Jeannette M.